I’ve always been reluctant to sew children’s clothes. So small and fiddly! They grow out of them so fast! And (in the UK at least) kids’ clothes are very good value for money in the shops so it isn’t remotely economical to make your own. But…My little boy has a really nice top made out of soft shell. 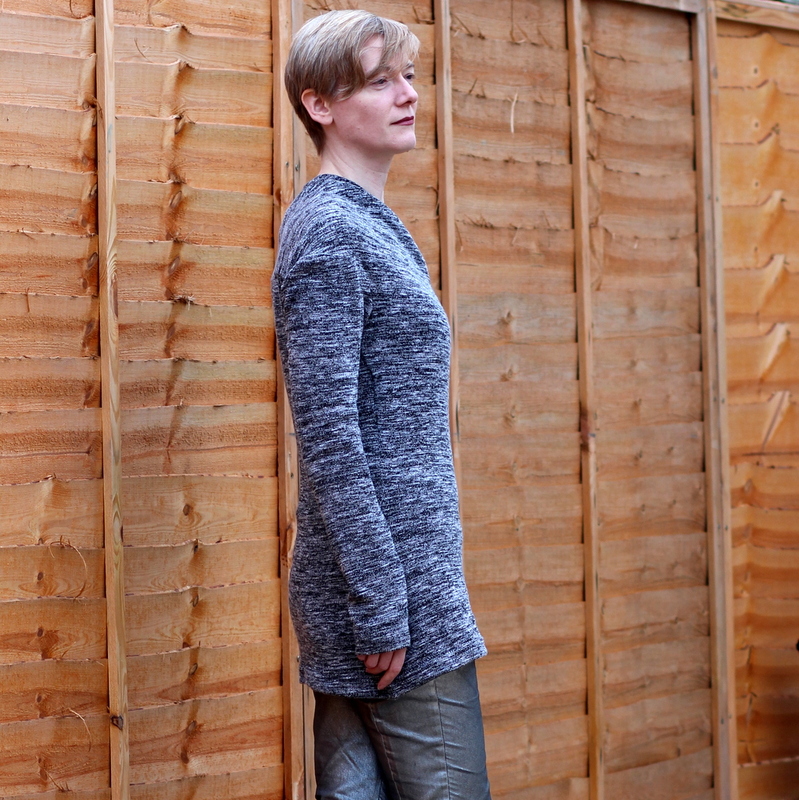 It has raglan sleeves and a neckline zip so it’s easy to get on and off. It’s one of his favourite things to wear. He’s also almost grown out of it and I haven’t been able to find a similar replacement. And it looked fairly easy to make – five pieces and a zip – so I decided to try to reproduce it. My first try was to trace the original top to make a pattern. That went fine. And then I realised that I’d just traced a garment that was too small when the whole point was to make a bigger version. Unsure how to grade it up I went looking through my Burda stash and came up with Burda 138 03/2014, a raglan sleeved t shirt pattern for toddlers. Burda say this is a girl’s top, but I can’t see anything remotely gendered about it. I traced it out one size bigger than my son’s current size because I wanted it to work as an outer layer with a t shirt worn underneath. I then made a collar pattern piece to fit the Burda neckline, copying the approximate shape of the one I’d traced from the original garment. I made the new pattern up in the leftovers from my husband’s green fleece hoodie to test it. The zip was a lucky find in my stash; it was too heavy for the project I bought it for but it was ok for the fleece. It could have done with being a little longer though. Here’s the back view. It turned out really well; it fits with a bit of growing room, and my little boy likes to wear it. It’s not perfect. I tried to flatlock the hem and it’s slightly uneven; also I didn’t do a perfect job on the zip and collar. You have to look super close to see though. And it sewed up fast: I put it together in about 90 minutes. So I forged ahead with the real thing, made in bright red soft shell from Empress Mills with a matching red zip. This time I bought an extra long zip and cut it off at a few cm longer than the intended finished length. Instead of trying to recreate a zip stop I laid the end of the zip opening on top of the zip teeth so the zip continues below the end of the opening, and top-stitched right over the teeth. The original top is constructed like this. Obviously I made sure it was a plastic zip rather than a metal one first, but I still broke a needle in the process. And it looks nice but it’s a very different garment than the green one! The soft shell I used for the red version is quite heavyweight; it’s really a coating fabric. This is more something for wearing to the park than around the house. The red fabric is lovely and bright and it top-stitches beautifully. I did a top-stitched hem because wonky flat locking would have stood out a mile on this fabric and you can’t unpick because the needle leaves permanent holes. Getting around those tiny sleeve hems on the machine was tricky though. I’d use this fabric again for a coat, but not a sweater. I’m quite tempted to make a third one of these in a cute snowflake print fleece I’ve seen online. Or there are lots of other child friendly fleece prints out there. I won’t be going into sewing children’s clothes regularly though! This is the first piece of menswear I’ve made for a long time. It’s Burda 120 12/2018 made up in dark green fleece from Empress Mills, for my husband. This is a nice easy to sew design and doesn’t require a lot of extra supplies beyond the fabric. The only notions used are a couple of eyelets and a cord for the hood drawstring. I didn’t even try to match the cord colour to the fleece but went with a black one. I had no idea what to search for online for the cord, so ended up getting one from Maculloch and Wallis when I was in London last. I think it’s this one which they describe as ‘acrylic wool cord’. The hood seam is flat felled so no hood lining is required. The picture below shows it a bit more clearly. This pattern is the one with the detailed instuctions in the issue of the magazine it comes in, and they’re pretty good with one exception. They have you set in the eyelets, sew the drawstring casing shut, and then feed the cord through one eyelet, along the casing, and out the other. They suggest wrapping the end of the cord in sellotape, presumably so you have something to grab and can easily feed it through the eyelets. I don’t know about you but that sounds like a recipe for intense frustration to me. I threaded the cord through the eyelets before sewing the casing shut and that worked fine. Speaking of eyelets, here they are along with the setting tool. I used 6mm ones. I’d never used eyelets in sewing before, and found they needed a surprising amount of whacking to seal them firmly in place. I was thumping away during my son’s nap praying it wouldn’t disturb him; luckily he slept through it. And it turns out that backing the eyelet area with a scrap of extra fabric is really important to getting a good result. As well as the scrap fabric I also added a small piece of interfacing but I’m not sure how much that helped; it’s the extra thickness that makes the difference. The pattern is well drafted – everything fits together nicely – but there isn’t a whole lot of ease. Next time I might go up a size, especially if using a very stable knit. Anyway I’d recommend this one as an easy sew with good results, and my husband’s been wearing the finished object a lot so that’s a definite success. And as a bonus there was enough fabric left over to make a little top for my son, of which more anon. This was a quick but not an easy project. The pattern is Burda 114A 11/2011, a fairly simple wrap over knit top. The pattern photo shows it made up in a very loose and drapey sweater knit; you can see it’s slightly transparent. I got some fairly similar stuff from Croft Mill’s sale recently. It was an end of roll so there’s no more available. It’s a loosely knitted polyester sweater knit in various shades of grey, black, and white. It came with a warning that it was tricky to sew and they weren’t kidding! You can stretch it a long way and it doesn’t snap back. I spent a long while trying to get it arranged on grain and without tension before cutting, but one of my sleeves still ended up 10cm longer than the other, and the back hem edge was on a steep angle. This was particularly obvious because the fabric has a subtle striped effect. I took my shears and cut the extra fabric off freehand, following the stripes, to end up with two matching sleeves and a hem that is on grain. I think it’s worked surprisingly well considering how misshapen my first attempt was. I really should have cut the whole thing out single layer. Most people who have made this recommended going down at least one size. I did size down but I also made my usual length additions and they weren’t needed. The sleeves are meant to be extra long anyway, but I think the body has come out much longer than on the model photo. The neckline on the model photo is very low but most people who have made this have found it comes up much higher and more wearable, me included. I can arrange it to be lower but it naturally settles as you see it in the photos. I constructed this mostly with a straight stitch on the sewing machine using a ball point needle and slightly lowered needle tension. 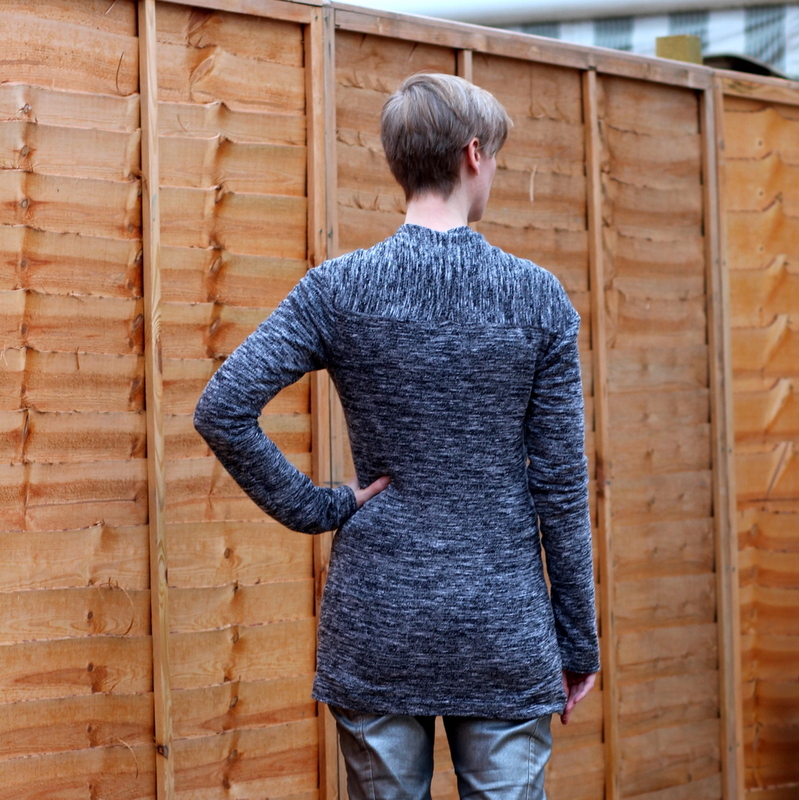 I tried the overlocker on a few seams but it didn’t like the loosely knit fabric at all. The fabric caught around the loopers at one point and required some vicious hacking with scissors to free it. The overlocker seems to have survived the experience but I lost a bit of width from the top around the bust area (I regretted using only 1cm seam allowances) and after that I didn’t risk overlocking again. I left the remaining seam allowances raw and sewed the hems with a wide zigzag positioned to go over the raw edge of the hem allowance. Hopefully it will hold up. Knits generally don’t ravel but this one might be an exception. I really like the finished top. I’ve seen a few versions of this in more stable knits and those looked pretty good too, so I might give it another go at some point. In a more stable knit this would be a great first knit project because there’s no neckband to deal with. I think I need a break after this particular version though; my next project is going to be made from nice well behaved denim. Thanks to my husband for taking the photos. This is an old favourite pattern, Burda 116 08/2011. Five or six years ago I used to have three versions in my wardrobe; it was my perfect dress at the time and it sews up really quickly so it was easy to have multiple versions. I made it up again this summer at the height of the heat wave. The fabric is a stretch cotton poplin from Tissu fabrics in bright pink. The original pattern was meant to be made in something drapey, but I find I like the effect in a crisp fabric. It’s taken a while to get photos and the first opportunity was a very windy day so excuse the strange folds. Thanks to my husband for patiently taking photos from several angles while we tried to keep out of the wind! I made some very minor changes to the pattern. I added 1cm to the side seams below the waist for a total extra 4cm circumference because the original hasn’t got a lot of ease at the hips. The pattern has you make bias strips to finish the armscyes. I cut an extra strip to bind the inside edge of the cowl too as it makes a much nicer finish than overlooking it. I added some interfacing to the back collar and the pocket opening edges. And finally I cut four of the pocket pieces rather than two so that I could have the pocket bags loose inside the dress rather than top-stitched to the dress front. I think the fabric is very slightly too light in weight for this style, but I love the colour. This time around though I am noticing a few little issues that I wasn’t conscious of in previous versions. 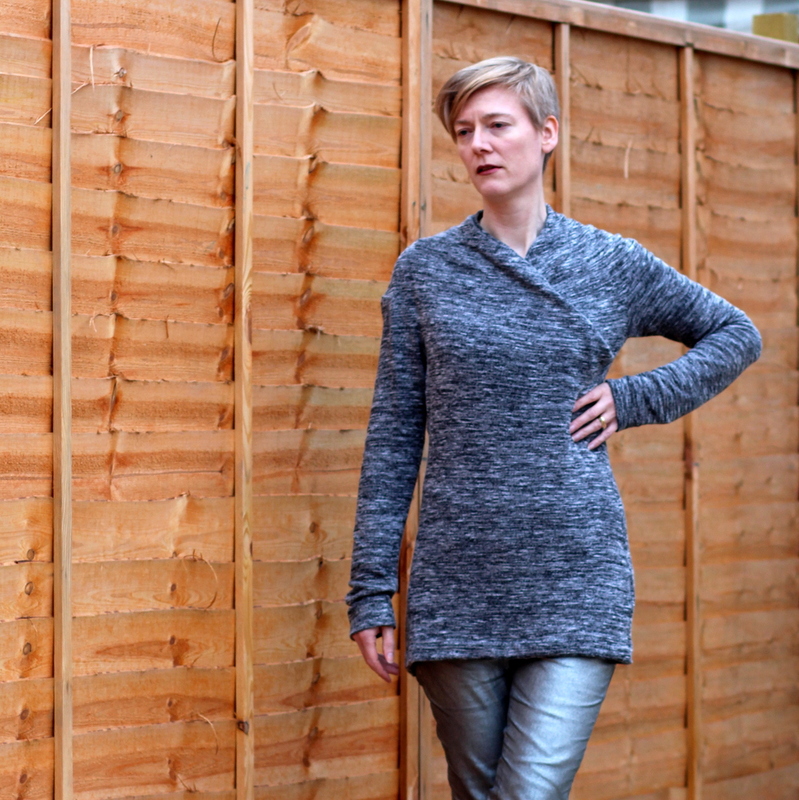 The sleeves are a bit restrictive, and the cowl neck has a mind of its own. I keep thinking that I won’t make another of these, but I also keep wearing it. Maybe I’ll make another in a heavier fabric. Sateen perhaps? I don’t think I want something as drapey as a crepe. I’ve made various pairs of silver jeans over the years, but never in fabric quite this reflective. It’s a foiled stretch denim from a new-to-me company, Top Fabric. I found it in their online shop a while ago but ummed and aahed about it for quite some time because it’s quite pricey and narrow enough that my favourite jeans pattern would need at least two metres. 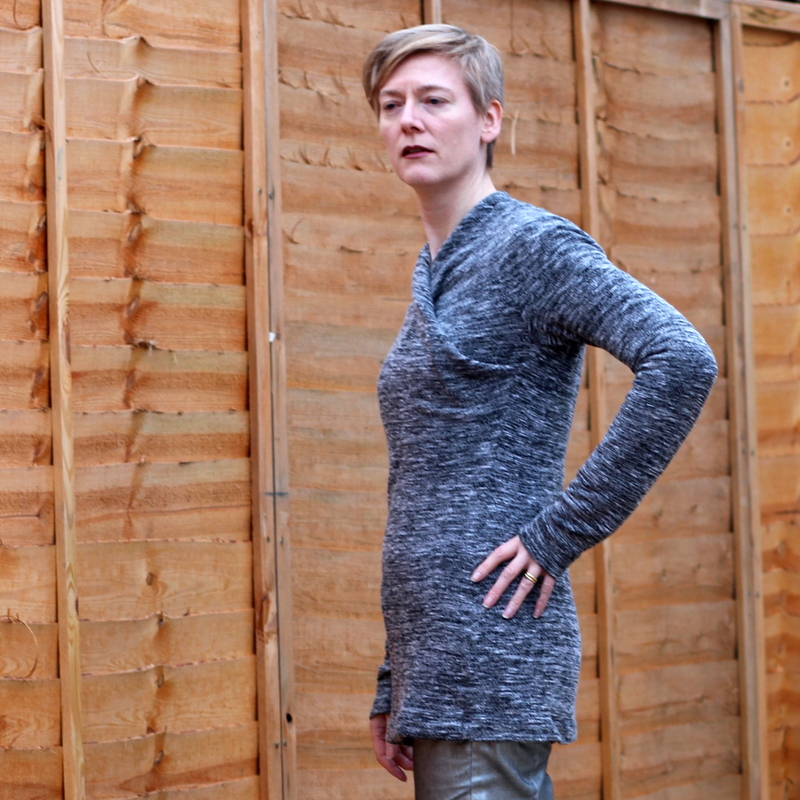 Anyway I was lucky enough to get fabric money for my birthday, so here are the ultimate silver jeans. The pattern started life as Burda 103b 07/2010 but I’ve made it five or six times over the years and tweaked here and there each time. The most dramatic change is probably lowering the waist by a couple of inches. The original pattern is astonishingly high waisted; something I often find with Burda trousers. I also added the back pockets to the pattern at some point. Looking at this version I think they need to be a bit larger and closer to the centre back seam. Maybe I’ll fix that next time. One thing I really like about this design is the extra panel down the side of the leg. It’s just about visible in the picture below. The top stitching caused much agonising over thread choice. I went with a very light grey and it seems to have worked well. I did the buttonhole and bartacks for the belt loops in regular thread in the same shade. I find I get a much better result that way; neither of my machines likes making dense zigzags in thick thread. The rest of the stitching and seam finishing was done with black thread because the base fabric is black. The fabric is a bit more difficult to work with than regular stretch denim. You can’t unpick without leaving marks and the foil surface is very slippery. I used Wonder Tape instead of pins to hold things in place while sewing the fly front and back pockets because pin marks would have been very visible. The fit isn’t perfect in that I have my usual problem of folds under the bum. But I have only worn these for try ons so far. I find the fit on skinny jeans improves after a bit of wearing time. My gold jeans had the same problem when I made them and now they’re much better. The silver ones currently feel quite tight but again I expect they’ll ease up with wear. I’m hoping these will be very versatile. I’m wearing them with a t shirt here but I think they’ll also work with a big white shirt, and worn under either of the white dresses I’ve made recently when the current heat wave finally breaks. And I think I have just enough scraps of the fabric left to make a Vogue 1247 skirt too. Silver is a neutral, right?